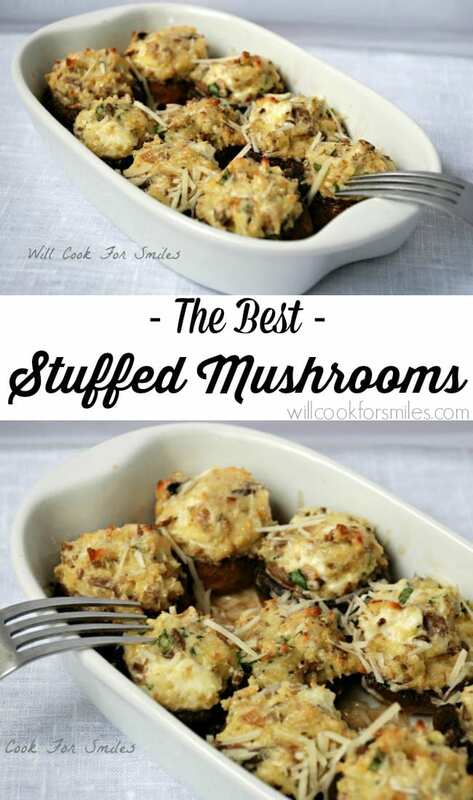 These are the best stuffed mushrooms! Classic Stuffed Mushrooms recipe featuring baby bella mushrooms stuffed with a mixture of cream cheese, herbs, onions and more cheese. 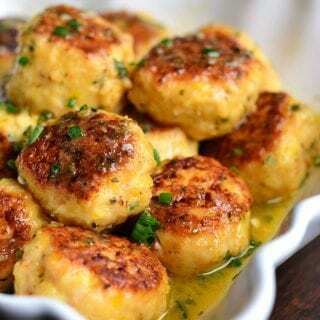 Classic appetizer to serve at parties and holiday dinners. Stuffed mushrooms are very easy to make and you can variate size of mushrooms depending on your needs. Use baby bella mushrooms for a simple one-bite appetizer that’s perfect for a party where people need to have their hands free. If you’re having a sit-down dinner party, you can use larger sized mushrooms. When using larger size washrooms, double the amount of filling so that you can prepare more mushrooms. To make this recipe gluten free, simply use gluten free bread crumbs. Increase the amount of bread crumbs by 2 tablespoons since gluten free bread crumbs are not as dense as regular ones. For those who do not like cilantro, you can substitute fresh parsley. 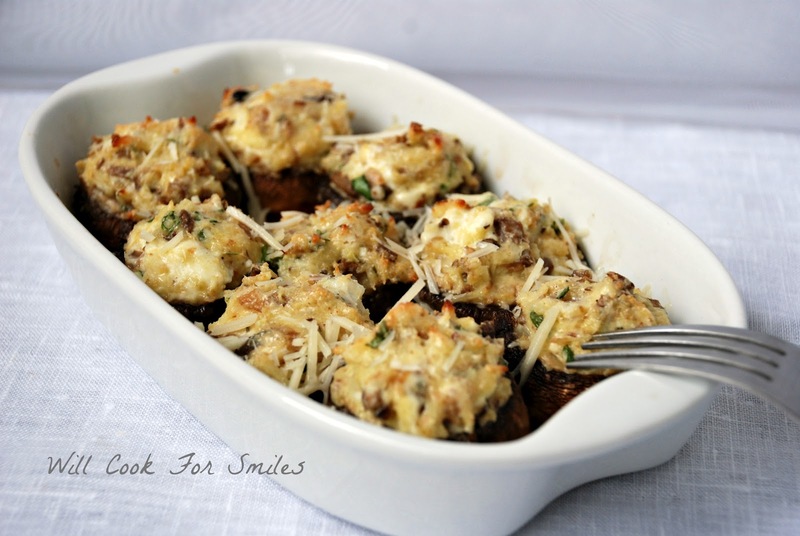 Classic Stuffed Mushrooms recipe featuring baby bella mushrooms stuffed with a mixture of cream cheese, herbs, onions and more cheese. Wash your mushrooms and carefully take off the stems. Toss the mushrooms lightly is olive oil and set aside. Preheat a small cooking pan and 1 tbs of olive oil. Chop the shallot and mushrooms stems into small pieces. Saute the chopped mushrooms and onion until tender. Mince the garlic cloves and add them to the pan. Saute until fragrant and move the veggies to the small bowl. Cool the veggies a little then add the cream cheese, bread crumbs, cheese, cilantro, egg, salt and pepper. Mix very well until all combined. Place the mushroom cups into the baking dish. Carefully fill the cups with the mixture pressing down lightly with your finger to fit a little bit more. Bake the stuffed mushrooms for about 15-20 minutes making sure that the mushrooms are completely cooked and hot throughout. 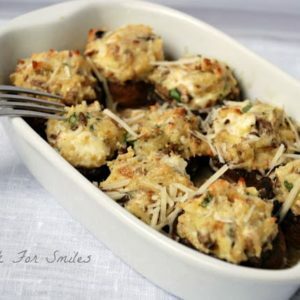 Sprinkle the stuffed mushrooms with some more fresh grated Parmesan cheese and serve! Originally published on Will Cook For Smiles on May 3, 2012. Love those! Perfect for Thanksgiving! I love, love stuffed mushrooms. and I love that this is a meatless recipe. Will have to give it a try soon, very soon! Thanks for sharing, Pinned! Mushrooms are my favorite. Can’t wait to try this recipe. Thanks for sharing. I’m your newest follower. I always find stuffed mushrooms to be a hit at parties and I haven’t made them in years. 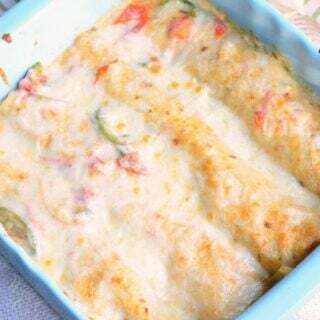 Please share this recipe on my foodie friday party today. 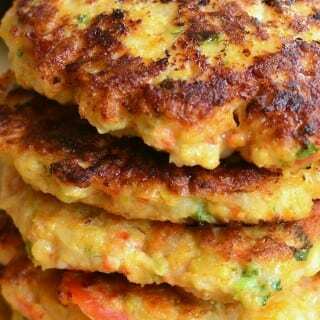 These look and sound yummy, will have to make them soon. cream cheese, parmesan, mushrooms and bread crumbs? My favourite combo EVER! 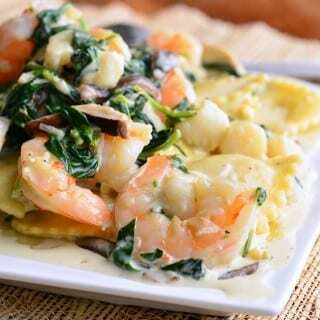 Thank you so much for this wonderful recipe! Looks and sounds great, as well as very doable with your great tutorial! I’m going to have to try these too. Great job! : )..
WOW! Those look amazing! Pinning! We love mushrooms AND cream cheese here in our house. I definitely need to try this recipe! Love stuffed mushrooms! You always having something wonderful to share! We love mushrooms!! These look fantastic! Thanks for sharing with us at Link It Up Thursday. Thanks, just made these tonight. I used a baby spoon for filling them and topped them with Panko, Parmesan, and EVOO (mixed). No one in my house eats mushrooms, but I liked the recipe enough to make a big batch just for me 😉 haha. Thanks again for posting. I found your site by googling mushroom julienne, but these just looked amazing too. Found your recipe on Pinterest and so glad I did. I made these for a dinner party last night and they were a hit. Especially love the bread crumbs part. Heads up your recipe ingredients only call for grated parmesan, but then your directions mention shredded parmesan. Thankfully I had both on hand because sprinkling grated on top I don’t think would have been as satisfying to the mouth or eye. Thank you!! I’m so glad you liked them 🙂 I’m always happy to hear that. Thank you for letting me know! I’ll fix the recipe asap. Your title is no joke! They’re the best stuffed mushrooms! 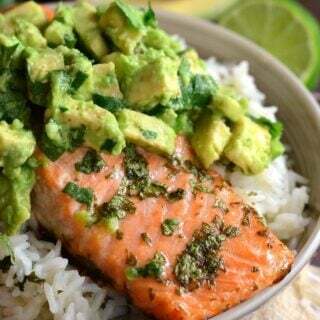 So happy I came upon this recipe & your blog! 🙂 I didn’t have shredded Parmesan cheese so I just broiled them at the end for color and it was so so so good. Def going to be making these more often! I’m going to be trying these! My husband loves mushrooms, and as I do not, I’m taking your word for it that these are the best. 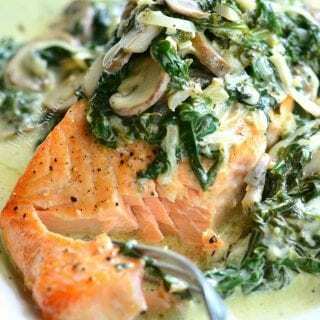 😉 One note though, you have cilantro in your list of ingredients but it is not used anywhere in the recipe, as well as having parsley written into step 6. I’m going to be using the parsley seeing as that is all I have on hand. Thanks for the recipe! Oh, thank you for letting me know!! These would be perfect for our office Christmas party. What type of mushrooms do you recommend? Is this something I could assemble at home the night before and pop in the oven at work the next day? I usually baby bella mushrooms, I just to to pick out the bigger ones and make them as even in size as I can. Can these be made and held in refrigerator overnite? Hi Mary Anne! I’m sorry for late response. I do believe you will be just fine to prepare them and stuff them the night before and just bake them the next day. What a great party appetizer! Can’t wait to try this recipe. I hope you will like it, Amy!